Give your facility a clean, fresh look with a professional heavy-duty power washer in Aurora. ServiceMaster of Aurora has experienced technicians who will remove dirt, moss, algae, and stains from your building. At ServiceMaster of Aurora, certified technicians use top of the line, state-of-the-art proprietary equipment and cleaning techniques. Get the exterior of your building looking its best, we guarantee it. Call 630-896-0030 today to speak to a knowledgeable representative about the wide-ranging service options from a professional power washer in Aurora, from the industry experts at ServiceMaster of Aurora. You can also email anytime at info@servicemasterofaurora.com. 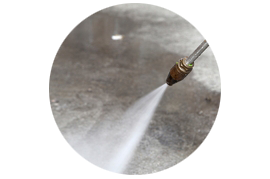 Experienced technicians at ServiceMaster of Aurora use heavy-duty commercial power washers to provide the kind of power to clean up the most stubborn stains and materials. State-of-the-art equipment, techniques, and processes are used by the most talented and experienced team of cleaning specialists.